Liam Young is an Australian born architect who operates in the spaces between design, fiction and futures. He is founder of the think tank Tomorrows Thoughts Today, a group whose work explores the possibilities of fantastic, speculative and imaginary urbanisms. Building his design fictions from the realities of present Young also co runs the Unknown Fields Division, a nomadic research studio that travels on location shoots and expeditions to the ends of the earth to document emerging trends and uncover the weak signals of possible futures. He has been acclaimed in both mainstream and architectural media, including the BBC, NBC, Wired, Guardian, Time Magazine, and Dazed and Confused and his work has been collected by institutions such as the Metropolitan Museum of Art and the Victoria and Albert Museum. 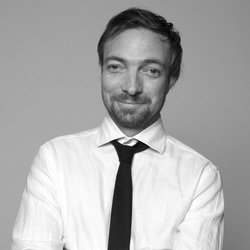 He has taught internationally including the Architectural Association and Princeton University and now runs an MA in Fiction and Entertainment at SciArc. Liam manages his time between exploring distant landscapes and visualising the fictional worlds he extrapolates from them.